DIACIDIA Griseb. in Mart., Fl. Bras. 12(1): 119. 1858.—Type: D. galphimioides Griseb. Sipapoa Maguire, Mem. New York Bot. Gard. 8: 124. 1953. Diacidia subg. Sipapoa (Maguire) W. R. Anderson, Mem. New York Bot. Gard. 32: 63. 1981.—Type: S. kunhardtii Maguire [D. kunhardtii (Maguire) W. R. Anderson]. Trees, shrubs, or subshrubs; vegetative hairs mostly basifixed or sub-basifixed; stipules mostly large to very large, intra- and epipetiolar, the members of a pair distinct or connate, the proximal portion of opposite stipules and petioles connate to form an interpetiolar sheath, persistent; leaves eglandular. Inflorescence terminal, a simple or compound thyrse composed of several-flowered non-decussate cincinni or a pseudoraceme of 1-flowered cincinni; floriferous bract and bracteoles caducous or eventually deciduous, eglandular, the bracteoles borne at the peduncle-pedicel joint; floriferous peduncle very short to well developed. Sepals leaving outermost petal exposed in enlarging bud, all biglandular with the glands borne mostly below free part of sepals, the sepals slightly (subg. Diacidia) or greatly (subg. Sipapoa) accrescent in fruit; corolla bilaterally symmetrical, the posterior petal erect and a different shape from the spreading to reflexed lateral 4 petals; petals light yellow, often with red claws, glabrous or bearing a few hairs on adaxial base of claw, the outermost petals shallowly concave to flat; lateral petals entire, erose, or denticulate; androecium radially or bilaterally symmetrical; fertile stamens 6–10, 1–4 of those opposite the lateral petals absent or reduced to rudimentary filaments in all but one species; anther-bearing filaments distinct or especially the posterior 3 (–5) up to 1/2 connate, alike, adaxially hirsute at the base with straight basifixed hairs; anthers alike, the outer locules bearing at the apex and angled forward 1 (2) stout basifixed awnlike hairs and otherwise glabrous or variously hairy on the sides, the connective equalling the locules or extended and bent forward between them at the apex; pollen radially symmetrical, 3-colporate; receptacle bearing straight basifixed hairs between androecium and gynoecium; gynoecium bilaterally symmetrical; ovary with 3 carpels completely connate, only the posterior 2 fertile, the anterior reduced to a ridge of tissue; styles 3, slender and subulate with minute, slightly subapical stigmas. Fruit dry, indehiscent, a tiny (ca. 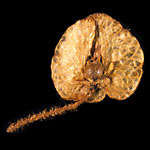 2.5 mm in diameter), spheroidal or ovoid, nutlike capsule with a bony, smooth or rugose endocarp, subtended and enclosed by the accrescent sepals, in subg. Sipapoa the sepals in fruit much enlarged, red, membranous, veiny, winglike. Chromosome number: n = (23?) 24 (W. R. Anderson, 1993a). This genus is obviously sister to Blepharandra, but with the tufts of hairs found at the apex of the anthers in that genus replaced here by a pair of stout awns; the petals here are yellow, while in Blepharandra they are all or mostly white, pink, or red. Subgenus Sipapoa is further distinguished by its huge stipules, by having the sepals becoming winglike in fruit, and by having 1–4 of the stamens opposite the lateral petals lost or rudimentary; the presumably ancestral D. galphimioides (the sole species in subgenus Diacidia) is much less derived. The ovary is consistently two-locular in Diacidia, whereas in Blepharandra it is sometimes three-locular and sometimes two-locular. The tiny nutlike fruit is the same in the two genera, and unique in the family. See the discussion of Blepharandra. References: W. R. Anderson, 1981b (pp. 60–71, revision [Diacidia only: pdf; entire paper 20 MB: pdf), and 2001a (pp. 29–134, partial revision). Etymology: Diacidia comes from the Greek words for two (di) and point or barb (akis), referring to the two stout awnlike hairs borne at the apex of each anther.